For effective management of Exchange server, it is critical to regularly check your Information Store and verify its consistency. The information store consists of various components. Each storage group in an Exchange server typically contains one or more Mailbox and Public Folder stores. At the time of installation, only one storage group is created by default. With Exchange Server 2000 and 2003, every Mailbox store comprises a database set consisting of two files: 'Priv1.edb' and 'Priv1.stm'. The 'Priv1.edb' file resembles a rich-text database that includes email messages, headers and text attachments corresponding to the messages. This file has both in-process and stored non-SMTP messages. The 'Priv.edb' also has a companion streaming file 'Priv.stm' that stores all multi-media data such as video, images, audio and other internet content files that are formatted as MIME data. Also, there are log files that are linked to the 'Priv.edb' file. These log files keep track of all the changes made to the database, such as emails that were sent or received after the last backup was done. During a backup operation, all data from the log files is moved to the 'Priv.edb' file. The size of the 'Priv.edb' file keeps increasing exponentially with time. This makes the file susceptible to corruption. Moreover, if you run across a dirty Exchange server shutdown and the transaction logs are damaged, you may not be able to restore or resynchronize the information store. Hard disk corruption and header corruption are other reasons responsible for causing damage to the 'Priv1.edb' file. How to Recover Priv1.edb File? Initially, start the information store service and note down all the errors and event IDs received. Now, stop the information store service and run these commands from the 'Bin' folder: "c:\exchsrvr\bin>eseutil /mh ..\mdbdata\priv1.edb"
Again check the consistency of both the public information store and the private information store. If they have become consistent, skip the next step. Remove the log files from the 'Mdbdata' folder. Also, delete the '.chk' file and the 'Temp.edb' file. Now, try mounting the databases and then, instantly dismount them. Run the 'Isinteg.exe' utility to test each database for consistency. Restart the information store service. 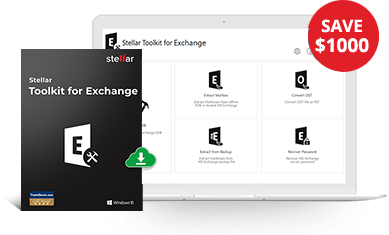 However, if the Priv1.edb file is severely corrupt and you are unable to mount the database and access your precious emails, use Stellar Repair for Exchange. The software is adept at repairing corrupt Exchange server database files, i.e. 'Priv1.edb' and 'Pub1.edb', and retrieving valuable user mailbox data. The competent tool can effectively restore emails, contacts, appointments, and other mailbox items. The Exchange EDB Recovery Software has dedicated indigenous mechanisms to perform a safe and precise repair of Exchange server database. The utility displays preview of different user mailbox items before recovery. Furthermore, it supports MS Exchange 2019, 2016, 2013, 2010, 2007, 2003, 2000, 5.5 versions and is compatible with Windows 10, 8, Windows 7, Vista, Server 2012, and 2000.